Within the Church, most of the time, the work of the nuns is confined to the kitchen even when they have studied theology. That is why the director of the publication that speaks on the subject in L'Osservatore Romano, Luceta Scaraffia said that to this day nobody has had the courage to denounce the mistreatment to which women are subjected in the churches and in that way give voice to those who do not have the courage to say these words publicly. The progenitor of Scaraffia did not agree with her religiosity leading her to monastic inspiration. As a child they changed it for a Spanish school as well, from a Republican from Madrid, who ran the Boston Academy, Mrs. Corina. There he converted to "humanism". That and her mother's own education, which came from a certain style of primitive matriarchy, led her to feminism during her student years in the 1970s at the University in Philadelphia, Pennsylvania. I am one of the partisan women that Women's Day is every day. I refuse to accept that it is only March 8, because there is no Man's Day, and it is obvious that they have taken over the entire year. Therefore, the strikes of March 8 in Spain are not enough, we must establish a current of total and permanent thought. To my surprise and to the world's surprise, some women who have spoken, although anonymously, have said protests, I am referring to the nuns. According to an article in the newspaper "El Mundo", of the almost 3,600 female monasteries in the world, 907 are in Spain. Some 31,000 women religious in total, then a question, if the nuns had gone on strike on March 8, what would have happened? The most probable thing is that no mass had been celebrated in Spain. To say of a nun who preferred to remain hidden her identity, the nuns have neither voice nor vote. As a child, she went to a school of Spanish nuns, the Siervas de San José, in the neighborhood of Vedado, in Havana. In Spain, they are called the Josefinas, and it is a very Castilian order, from León and Valladolid, so their parents, who were Galician, wanted to be taught a pronunciation of Spanish as they should have been. She adored her nuns, even though they talked a lot about Hell, but they gave classes based on the "Sacred History", a book with drawings and very simple words, which summarized the Bible in about 200 pages. 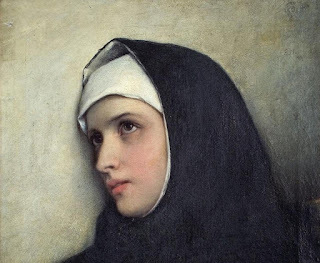 Seeing herself so impressed, her mother discovered that she was being sought for a nun. Soon she realized that there were sisters, cooks and servants and mother teachers and also the Mother Superior, above all. The school was divided into social classes. Maybe it had to do with talent, perhaps with the fact that some nuns had not delivered such a good dowry for the order. They were very submissive to each other, although they punished the students by pinching their ears. However, now he has been very happy to know that even the nuns have rebelled or rather revealed the truth, that submission to God does not match the servitude to the prelates of the Roman Church. It is enough that they are relegated and become servants of the clergy. Jesús Pretty in a note, which in turn was stolen from the Vatican newspaper, reveals a reality that, for the first time, has recognized its official journal, "L'Osservatore Romano" women within the church are also exploited.